Last year I mentioned that Exile publishing was putting out a special steampunk anthology that would be very specifically Canadian. Well, it's almost here, and I've had the opportunity to read it. It's wonderful! The stories cover our great country from coast to coast. It also includes many historical figures, immigrants, and aboriginal nations. It's a true Canadian melting pot. Also, there is everything from clockwork (as indicated in the title), to steam, electrical wonders, and even the supernatural (gaslight). The tone of the stories are quite varied as well. There are stories that are funny and whimsical, and there are stories that are very dark and quite sad. Each story is very unique and the authors have done a lovely job of bringing to life an alternate Canadian history. Two of my favourite stories are The Curlicue Seahorse by Chantal Boudreau and Bones of Bronze, Limbs Like Iron by Rhea Rose. 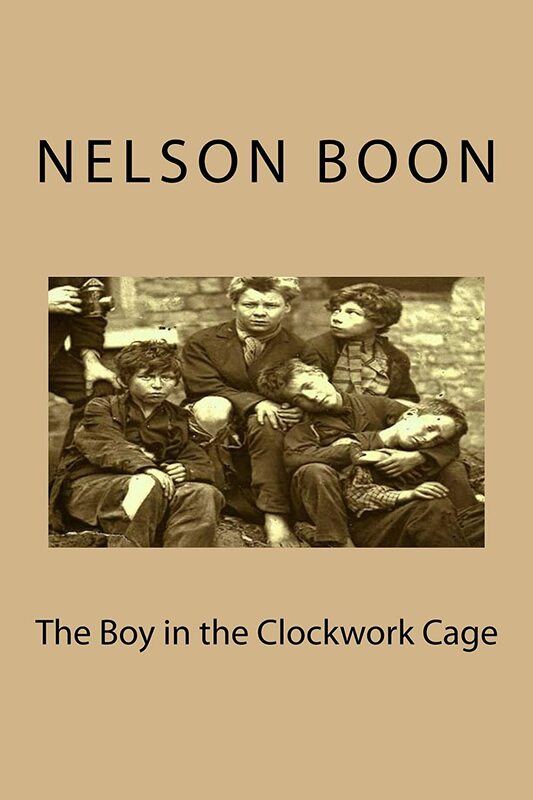 The only story I didn't particularly like wasn't because it was bad, or because it was quite steamy (don't let the kids read this one), but it was because the author used two important figures from a much earlier period (the war of 1812) and set them, and the war, in 1899. Now while I appreciate it's an alternative Canada, this was a little over the top for me. Especially as I know the period fairly well. If you don't know the history behind the characters, and you like your steampunk on the saucy side, then you'll enjoy Let Slip the Sluicegates of War, Hydro-Girl. Generally though, the whole book is quite good and you can easily read a story or two a night. And it was quite nice to encounter more Canadian content in the steampunk genre. I recommend Clockwork Canada. You can get your own copy from Exile when it's released on May 1st. Film and documentary maker Annie Deniel is working on a special documentary with a large group of steampunks from Canada and abroad. The project is mostly complete, but she has started an Indiegogo campaign to help finish it the best way possible. Any size contribution helps and any money raised during the campaign will go toward the documentary. 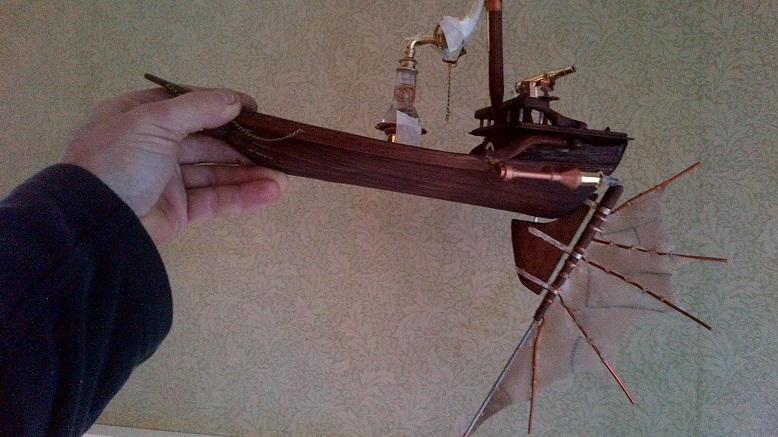 Please help this fantastic Canadian steampunk project get finished and shown around the world. 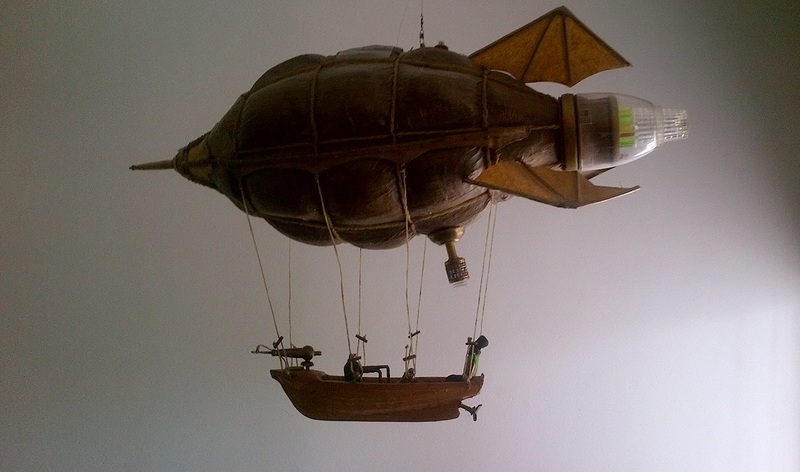 The Steampunk Makers Workshop group on Facebook has put out a challenge to makers and tinkers around the world. 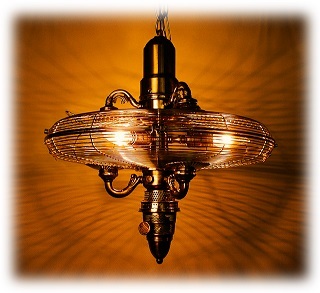 You must build a device in the Steampunk style. 2) It must have a conceivable function (even if fictional). It cannot be just a box to put something else in. The box is the base of the challenge. It must be converted into something other than just a box. 4) The box itself is integral to the design. Examples will be posted of possible projects. 5) No guns, but it can be part of a weapons system. 6) Finally there is a strong encouragement to use recyclables and junk finds within the build. Winner is decided upon a 7 day open poll. 9) This challenge has a maximum budget of $20. International Bragging rights and the choice of key items in the next build challenge. To enter the Challenge, simply sign up for the event and start your build! Contest Date: March 10th - May 9th. Entries need to be in on or before May 9th! - Work In Progress (WIP) photo's are appreciated. - WIP's will be added at Steampunk Makers Workshop page. - All pictures should be posted to the event page, WIP and completed entries. After the Challenge closes on May 9th, an open poll will be made at the Steampunk Makers Workshop page where you all can vote for your winner. The challenge is free to participate to all and photo's of all entries will be placed in a separate album. Give me a message if you have any questions. There will be no catagories in this build. The qualifications looked for will be creativity and the Steampunk style. Now, go build something Splendid!!! 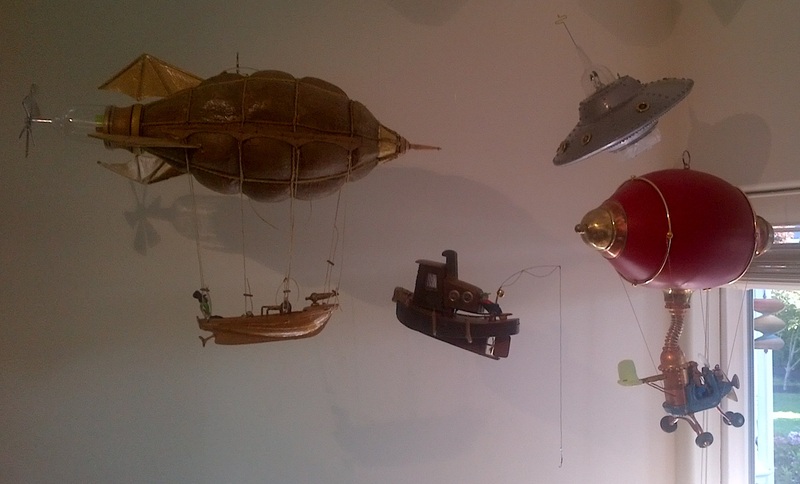 A couple of years ago, Canadian artist Gary Helps introduced us to his steampunk inspired wind chimes. At the same time, he was just starting to experiment with making lighting too. He is now creating more light fixtures, and they're just wonderful. This piece is comprised of two floor lamp trilight elements, oil lamp pieces and a custom designed and fabricated socket structure plus a 14" fan cage. Supplied with decorative chain and canopy ready to mount. The central structure of this particular piece is a well disguised vintage medicinal epothecary jar. 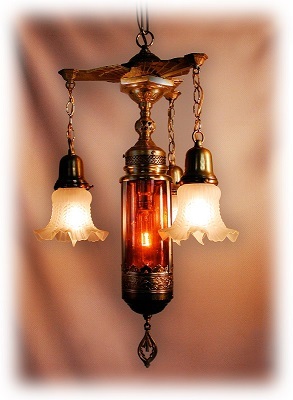 It is embellished with various and sundry metallic paraphernalia including a hanging oil lamp counterweight casing on its lowest extremity and an inverted brass table base attached to a 3 armed deco fixture element on top from which hang 3 fluted, frosted shades. 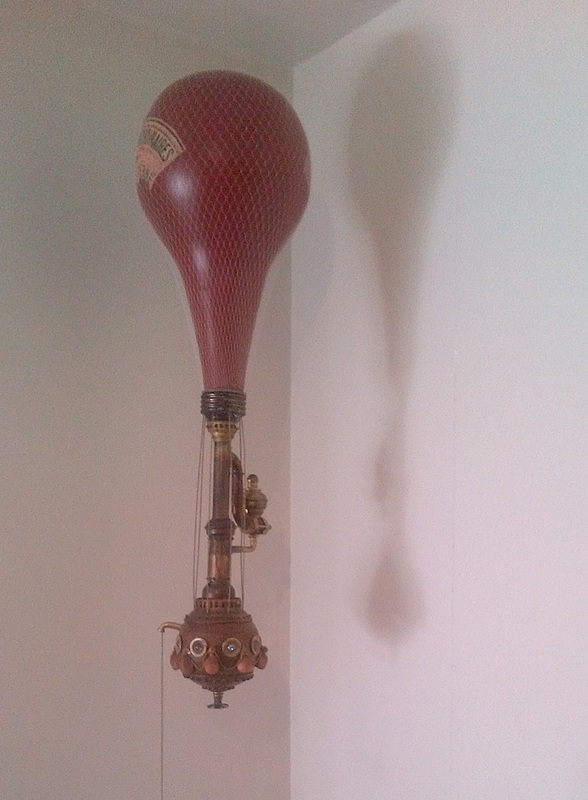 Mounted inside the jar is a vintage brass socket with the source of illumination being an elongated picture light bulb. This is the very first post here on Steampunk Canada! And here we are today, over 1,000 posts, photos, videos and shared conversations. 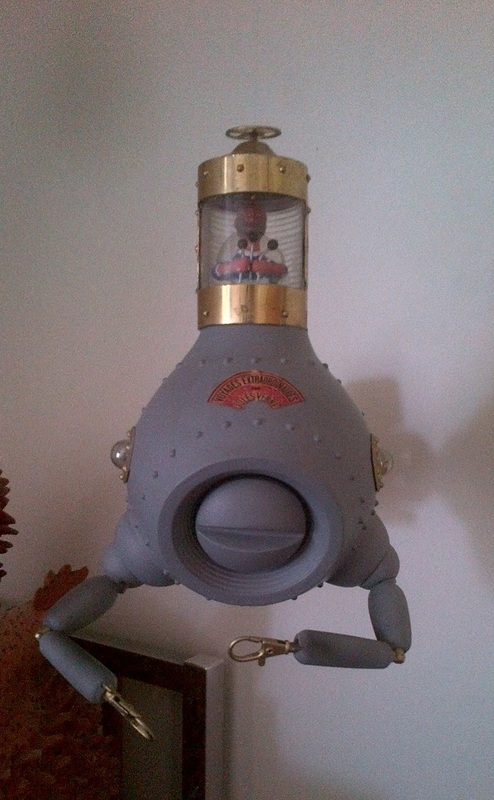 Steampunk Canada member Hover Ralph aka Ralph Heading lives by the ocean in BC, in the village of Boundary Bay. 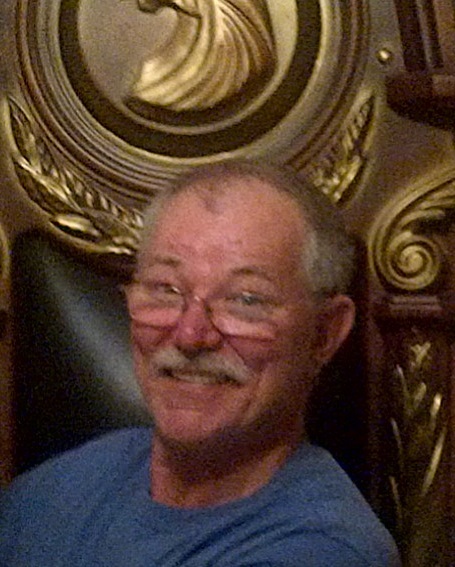 He is a retired carpenter, who was sent out to his workshop to "clean up the crap you won't need anymore". What you're about to see is what all that junk became. 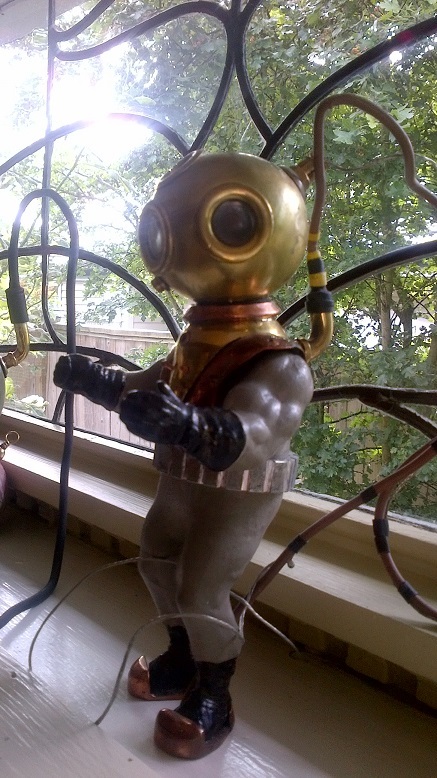 His sculptures are pieces of pipe, brass fittings, and turned styrofoam. He spends a lot of time at the dollar store, as every piece has another feature in the dark, when they light up. His aim is to have all his pieces reflect technology from the time before the internal combustion engine. New pieces he is working on now have the patina acquired from having been in the air for the last 150 years. He has some idea of propellers and flying as he has an actual hovercraft, which explains his nickname Hover Ralph. 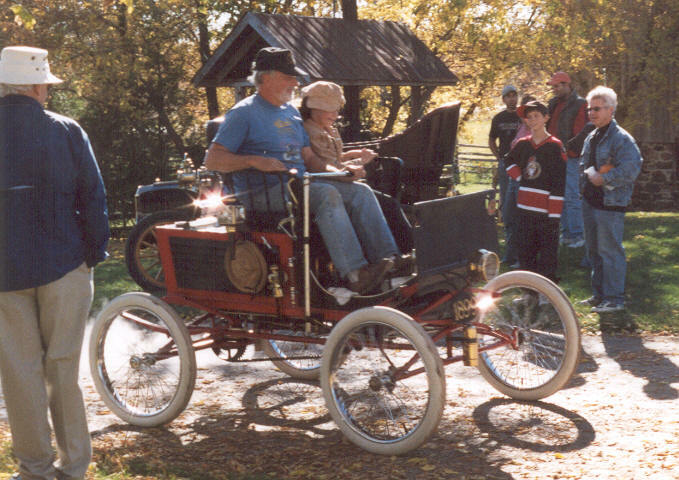 The Horseless Carriage Museum is a private, non-profit museum located in the Kawartha Lakes, halfway between Bobcaygeon and Fenelon Falls on County Rd 8. 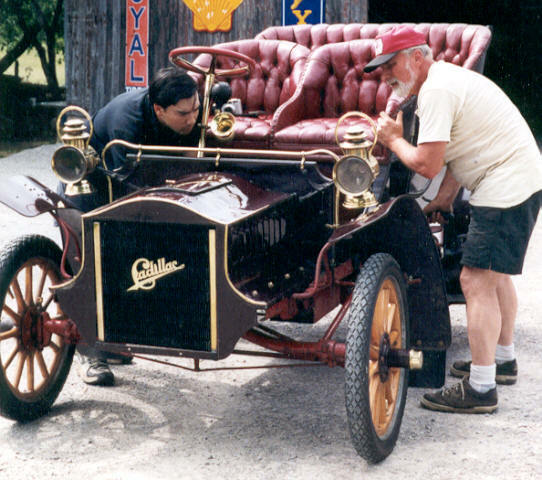 They specialize in pre-1914 transportation and turn-of-the-century antiquities. 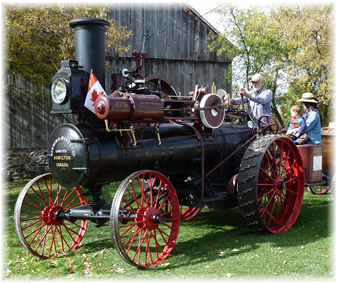 They offer one hour tours of their displays from May to October between 10am and 4pm. Admission is a minimum $5 donation per person. There is lots of free parking too. Call (705) 738-9576 or email bennett@horselesscarriage.ca for more information or to book an appointment. A year ago I introduced you to the alternate Victorian era created by author David Barnett, and the adventures of Gideon Smith. Gideon's latest adventure is here and it's just as brilliant as Barnett's first two novels. Back in London, Gideon and his colleagues: journalist Aloysius Bent, airship pilot Rowena Fanshawe, and Maria, the mechanical girl are dragged into a case that is confounding the police and Inspector Lestrade. The city is on the edge of mass rioting due to the continuing reign of terror by the serial killer known only as Jack the Ripper. While chasing the madman, a villain from their past strips Gideon Smith of his memory and he is cast adrift in the dank underbelly of London, where life is tough and death lurks in every shadowy alley. With mob rule threatening to engulf London, and one of their own in grave danger, the Empire has never needed its hero more. This third book in the series starts very soon after the last one. The reader will find that while the story is brand new, it also smoothly incoporates many parts and characters from the heroes' adventure in Gideon Smith and the Brass Dragon. Gideon Smith and the Mask of the Ripper has a number of new mysteries to be solved. There are also a number of new fictional and historical figures that Barnett has a great time with. For example, John Watson is indeed a doctor, but Sherlock is his patient. Watson encourages his delusion of being "the great detective" as a means of treatment. And yet he does have a knack for solving mysteries. Nice twist. Another great addition to Barnett's alternative Victorian London is Madame Lizzie Strutter who forces all the Whitechapel prostitutes to go on strike until Jack the Ripper is caught. Again, a nice twist that lends a lot of interesting elements to the story. This story has less of Gideon Smith as the main character and hero, and more of the ladies of his crew: Rowena and Maria. It gives the reader a great opportunity to learn a lot more about them, and to see them in a very different light than in the previous books. This goes for their housekeeper as well. Sally Cadwallader has had quite an interesting past. One of my favourite parts of this story has Maria learning a lot more about herself as a "person" and not a machine. She meets and becomes friends with Gloria Monday, a transgender woman who teaches her a lot about being your true self. Barnett has done an incredible job with this character and I applaud him. He gets it. She is so wonderful, and her relationship, that the reader learns of later in the book, is very touching. I greatly recommend this book purely for this aspect of the story. But I also recommend this book because, even though it's based strictly in London, it is still a great adventure. Victorian London has many layers and different worlds within it, and the author does a wonderful job of taking the reader into every nook and cranny. Lastly, I have a small warning for readers. There are some very dark scenes, and one in particular made me cringe. It's an appropriate scene, but ewww... that's the only way I can describe it without giving anything away. Forewarned is forearmed. Thanks to Tor for sending this my way. It's simply a brilliant continuation of this Hero of the Empire series. Last year Steampunk Canada supported an indiegogo campaign for a group of 2D animation artists who wanted to tell a steampunk story called Hullabaloo. It was wildly successful and it's currently in production. We can't wait to see it! But in the meantime, they sent out all the physical perks to its supporters. That means we have sometime to giveaway to you! 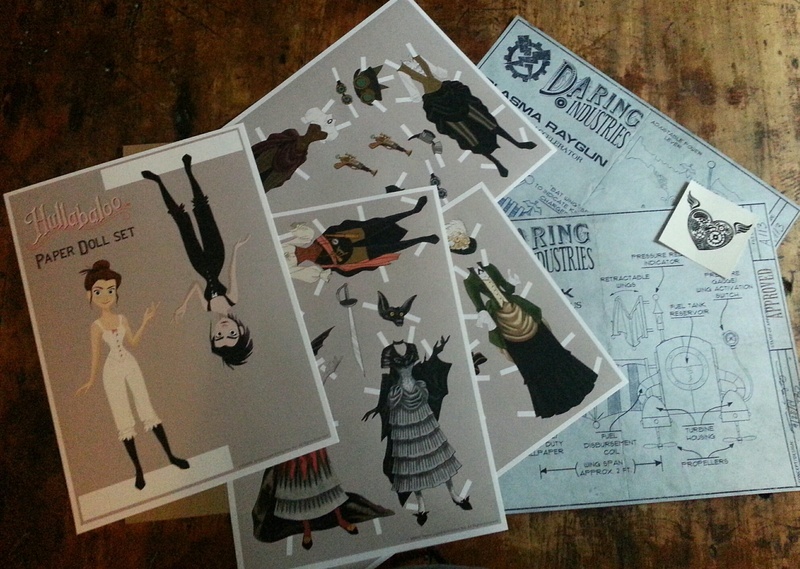 We have a beautiful set of paperdolls and their clothing from the animation, as well as gadget blueprints, and a sticker. All you have to do is comment below and we'll enter you into the contest! You have until Monday, November 2nd to enter.